Invented and designed by Naoaki Sakata MBA, a 2nd Dan Sumo wrestler from Japan, the Kabuki Glasses don't only look unique, but they have a very interesting and unique backstory to them as well. Naoaki initially designed them to be used as an alternative to the more traditional theater binoculars and got the idea watching Kabuki, a traditional Japanese dramatic dance shown in theatres in Japan and is indeed where they get their name from. Since then he tells me that not only are they ideal theater and opera glasses, but he also has customers who use them for watching sporting events and have even taken them on safari! I am not sure if I would personally recommend the Kabuki Glasses over a pair of really good pair of safari binoculars, but when you consider the specifications (see below), they really do look like they will compete and most probably beat most (if not all) theatre glasses and I can see them having the potential to be good hands-free binoculars for watching sports events. Binocular Glasses or Hands-Free Binoculars? Whilst doing my research on the KabukiGlasses, I noticed a number times where people were asking if these could be used for people who have poor eyesight to help them read or perhaps view the television for example. So I think it is important to clear up that whilst you wear them like glasses and indeed their name indicates that they are glasses, I think you should rather think of them more as a pair of hands-free binoculars. With a minimum close focus of 10m (33ft), they are not designed to be used for close-up observation. This is just something to keep in mind as we go on. Before they arrived on my desk, one of my concerns with them was just how sturdy and robust they were going to be. Well I can happily report that whilst I wouldn't suggest throwing them about, they look and feel extremely well made and whilst like any pair of standard glasses, if you were to accidentally sit on them or something like that, I could see the temples (arms) being in danger of getting broken. However these temples are definitely robust in comparison to those on most normal glasses, so as long as you look after them, they should be ok. The joints too have screws and so I am sure could be replaced if needed. What I also liked is that there is a good degree of stiffness to these joints and so they don't just flap about which is one thing that has really bugged me on some sunglasses that I have owned in the past! 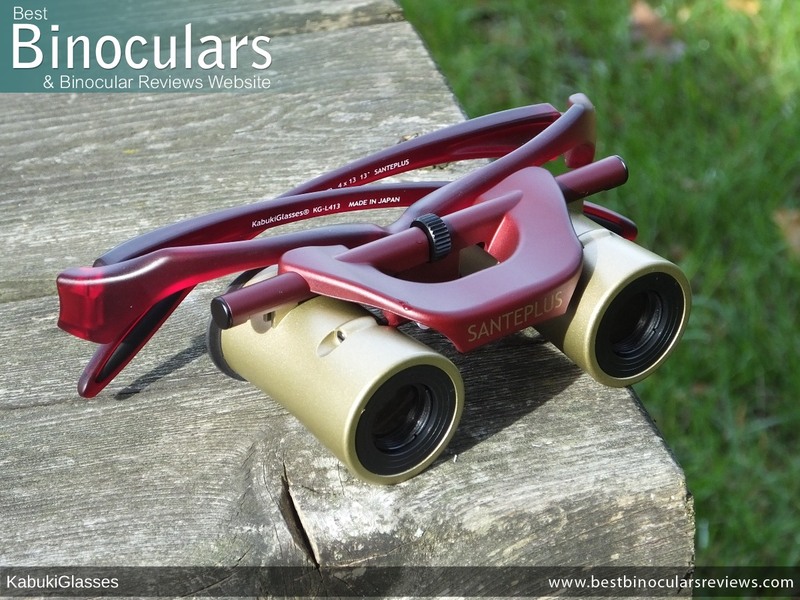 The binocular part of the body also looks well made and the barrels have a metal exterior. With most binoculars, you adjust the distance between the two eyepieces to match that of the distance between your eyes (IPD) by opening and closing a central hinge. As this is not possible with the Kabuki Glasses, they have a rather ingenious way of overcoming this problem. You simply rotate the small black dial located at the center of the bridge. This then either pushes the two barrels apart or brings them back closer together. Note: it is very important to get this adjustment right and to line up the lenses with your eyes. If they are not, you can't see the full view and you get black rings forming around the edges. The good thing about these is that the mechanism is very smooth and precise and so it makes achieving this very easy and once you have your preferred setting, it remains in place. This adjustment takes them from a minimum distance of 5.2cm, up to a maximum of 7.3cm. 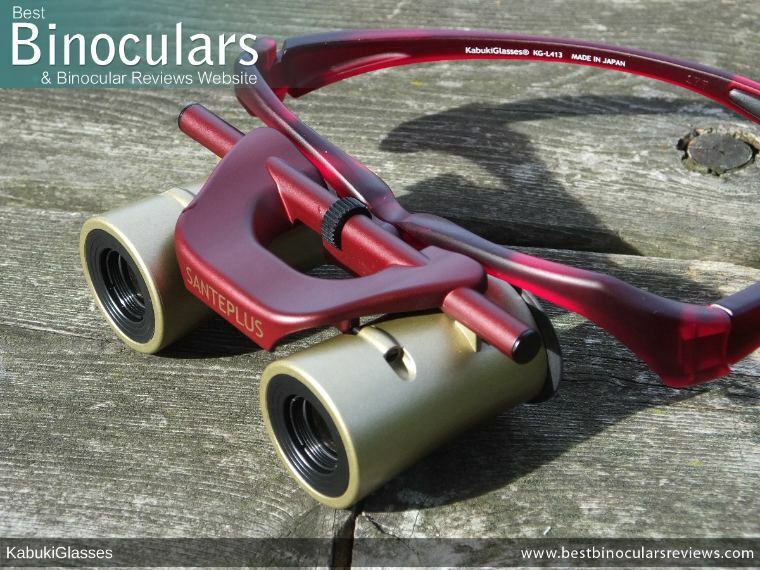 This interpupillary range is good and matches that of many standard binoculars and so should be suitable for most users. In this section of my reviews, I usually talk about how one goes about adjusting the focus. However even though SANTEPLUS market these as having an "Auto Focus" mechanism, this is a little misleading. I say this because the Kabuki Glasses have a fixed focus system, meaning that from their minimal focal distance of 10m to infinity they are always in focus and no focus adjustments are necessary or even possible. Another aspect to keep in mind is that these, like all other opera glasses that I have used don't have a way of making diopter adjustments. On most binoculars this is possible and is there so you can calibrate each barrel independently. So what this essentially means is that if you have poor eyesight in one eye, you will not be able to compensate for this as you can with most standard binoculars. If this a problem for you and you are looking for a pair of binoculars for the opera or theater, then I would recommend getting a standard pair of compact binoculars as most of these do enable diopter adjustments. Once again and just like most theatre glasses, the Kabuki is neither water or fog proof. So whist this is fine for indoor use, I would not suggest taking and using them at an outdoor concert or sporting event if it is raining, unless you have a good umbrella! Another thing to just keep in mind is that the seals on a watertight binocular also prevent tiny particles like dust from getting inside. 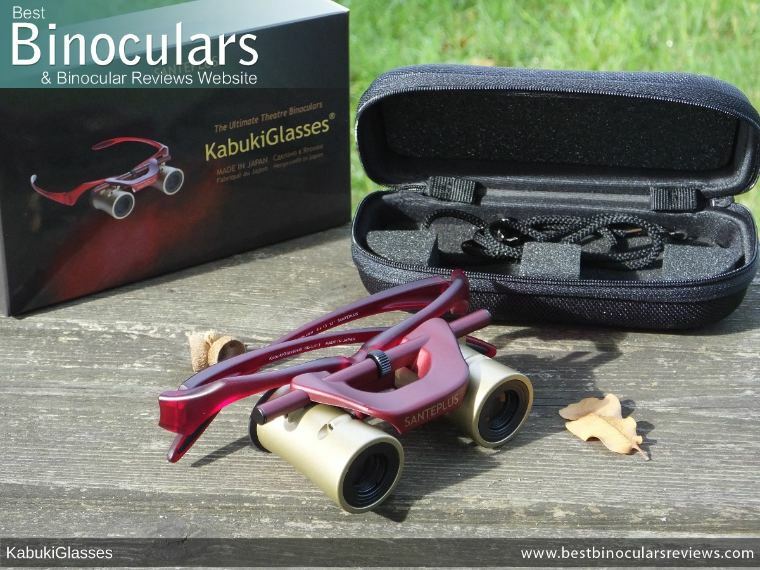 Whilst all the lenses look like they have seals around them and there are no obvious gaps anywhere, it would be a good idea to keep your Kabuki Glasses stored in their excellent case which they come supplied with when not in use, just to be sure. As the Kabuki glasses sit on the temple of your nose, you don't really push them against your face as you do with normal binoculars. Because of this these don't have or require eye-cups. The eye-relief on these Kabuki Glasses is 12mm, which if you compare them to most theater glasses and indeed many standard compact binoculars is pretty good. However as you can't wear them in tandem with your glasses, the eye-relief only really means that this is the ideal distance that the lenses should sit away from your eyes to get the full field of view. To adjust this you simply move the glasses up and down on your nose. For my particular shape of face (and nose! ), I found the 12mm to be just about right, but I did have to have the glasses pushed quite firmly back as far as they could go. 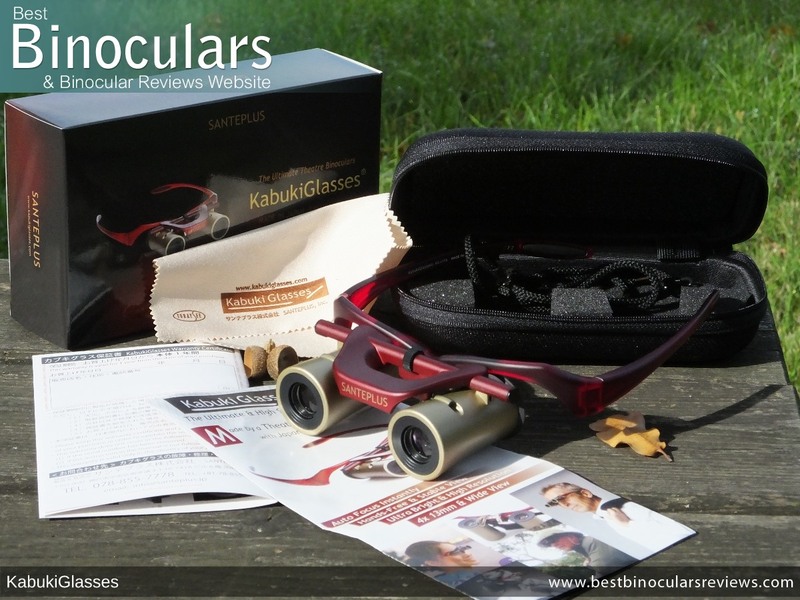 The Kabuki Glasses weigh in at 3.3oz (92g), which for a binocular of any size is extremely lightweight. Obviously compared to your standard glasses this is somewhat heavier and whilst this is noticeable when you put them on, it really is not an issue and I could quite comfortably wear them without any problem for the duration of the show or game. I think this is comfort is enhanced by the fact that they have a very comfortable really sort and flexible nose piece that looks to be made from a kind of silicone/ rubber material. Also well worth noting is that this nose piece offers plenty of grip and so I found it would really help the glasses remain n position no matter where I placed them on my nose. I say this is worth noting because once again if I compare them to some sunglasses that have a harder plastic nose piece, this is a vast improvement on both the level of comfort and grip. I have found some cheap sunglasses to rather annoyingly keep sliding down my nose. This was not the case with these which is great. The barrels on the Kabuki Glasses are 4.8cm long and with the temples (arms) folded the whole unit is roughly about 8cm long and 14cm wide. I did ask, but Kabuki Glasses and their inventor won't go into great detail as to the exact makeup of the optics used on their instrument. But what I can let you know is that they use optical glass and not plastic as is used on many cheaper theater binoculars, which is good. They have roof prisms inside made from BK-7 glass. 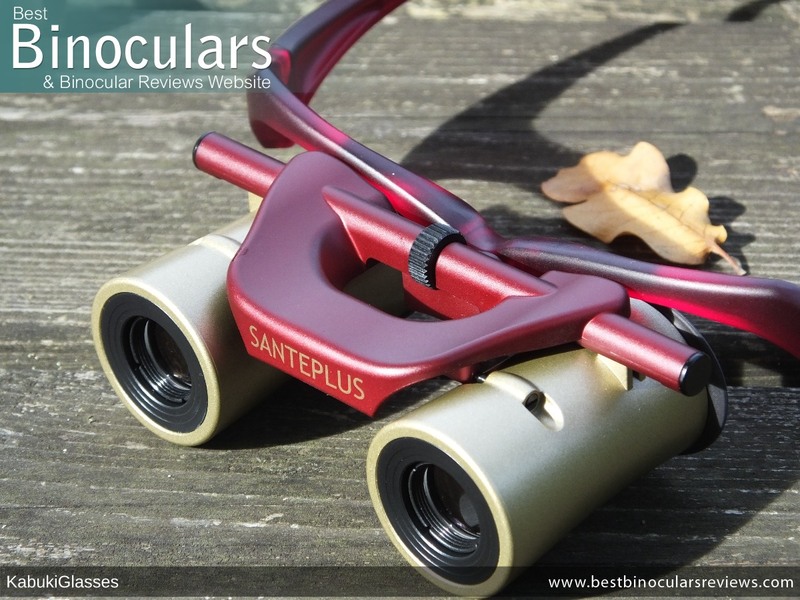 This makes them far more like standard binoculars and quite a lot different to most theatre and opera glasses that I know about as they usually use a much simpler Galilean design that does not require a prism to erect the image. Whilst this most certainly makes the Kabuki Glasses more expensive to make, it also brings with it a number of advantages. The most important of these being that they can deliver a much wider field of view. A narrow view is one of the main problems associated with the design of Galilean binoculars and is one of the major issues I have with most opera glasses. To be able to enjoy the whole show or sporting event without having to move your head about to follow the action, a wide FOV is critical and so this is another area (as well as not having to hold binoculars up to your face for the duration) where I feel the Kabuki Glasses have a major advantage over your normal opera glasses. Galilean binoculars also tend to suffer from much more blurring around the edges of the view, compared to most modern designs that use prisms, so this is another potential advantage these Kabuki Glasses have over much of their competition (see the Image Quality section below for confirmation of this). As for coatings, all I know is that they are "coated" so whilst I think they have some anti-reflection coatings, I am not sure as to what extent they are and which surfaces are coated. My assumption would be the outer most ones (objective and ocular lenses). 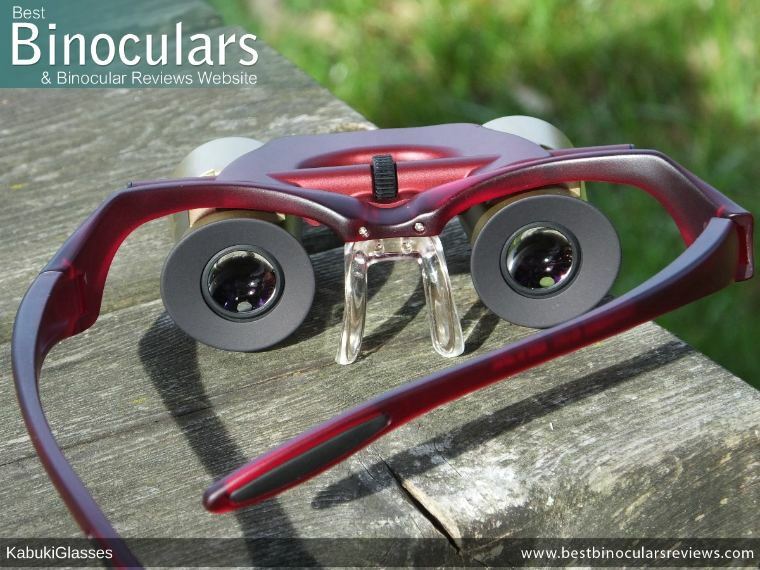 The ocular lenses have the same diameter of 13mm as the objective lenses, which is bigger than most standard opera glasses and comparable to many normal compact binoculars. 675ft wide at 1,000 yards / 225m at 1,000 meters, which is an angle of view of 50°! 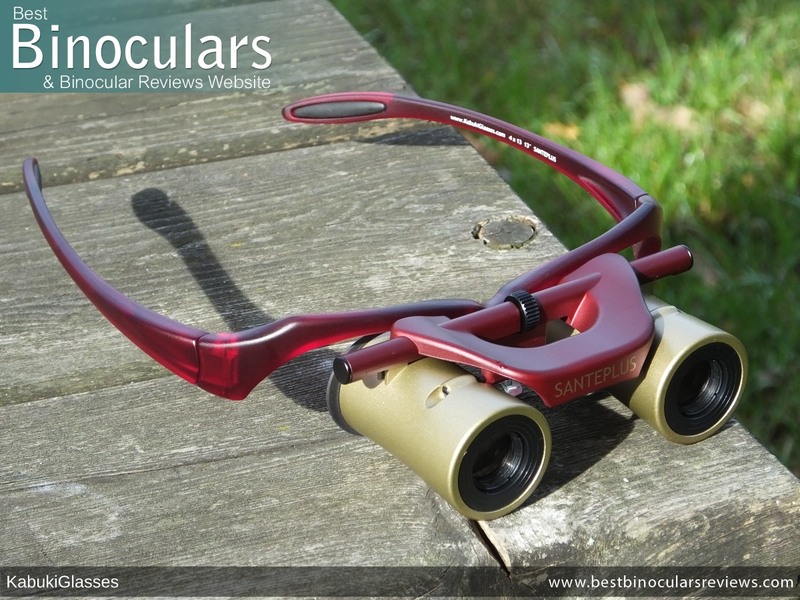 Compared to most standard binoculars and especially most normal opera glasses, this is a huge difference and which for me is one of the main and critical advantages these have over them. A wide field of view like this means you will be able to take in all of the action, be that on stage or on the pitch without having to keep panning your head about as you do with the narrow view on a normal theater glass. If you also consider that because most standard opera glasses use the Galilean design, this means that their effective width of view is even less than stated because this design means that they have a large area around the edges of the view that is blurry and out of focus. This makes the FOV on the Kabuki glasses even more impressive as you will see in my Image Quality section below. The minimum focal distance on the Kabuki Glasses is 10m (32.8ft) which for using them at the opera and sporting events is perfectly fine... that is unless you have incredibly good seats, but if you do you shouldn't need binoculars anyway! However as mentioned earlier and for those who were wondering, it does make them unsuitable for reading and I guess watching the television if you have bad eyesight. Also the close up observation of butterflies, other insects and flowers is not possible with these which is a shame. I had also initially thought that these may be ideal to take to a gallery or museum, but with this relatively long minimum focus distance, this not the case, which is a slight shame. As I have already mentioned, the eye-relief is 12mm, so this is the ideal distance to set the Kabuki Glasses away from your eyes to get the full width of view. 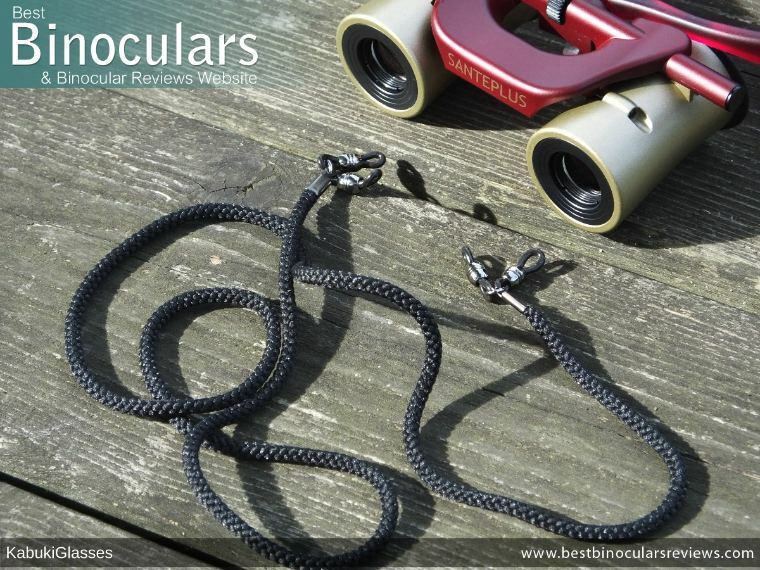 When I review most binoculars on BBR, I compare the view of the instrument in question against that of a similar benchmark binocular that I have to keep my views as consistent and objective as possible. However with the Kabuki Glasses, this was not possible as I do not have a benchmark or indeed any theater glass currently with me and comparing them to a standard compact binocular is not really ideal in all areas as they are so different in many ways - take the difference in magnifications for example. Thus many of the opinions below are based on memory compared to other opera binoculars in my experience. With a 4x magnification and 13mm objective lenses, the Kabuki Glasses produce a exit pupil that is 3.25mm in diameter, which is a fair bit smaller than on your standard 8x42 binoculars (5.25mm) and so for general low light use these are not ideal. However even though many operas, ballets and shows take place at night, you are looking at a brightly lit stage and so there is far more light concentrated and being directed to your eyes than if you are simply looking around normally in the evening and thus this should not be an issue. So whilst I must confess that at the time of writing, I have not yet had the opportunity to test them at a show (as soon as I do I will update the info) but what I did do was to look at the full moon,which is a much tougher test I am sure you will agree and which the Kabuki Glasses passed with flying colors. So my general thoughts on the image brightness on these is very good. As well as a bright image, the colors of the view was good. By this I mean that the colors were vivid, natural looking and there was no sign of any tinting. The level of contrast was also normal, so the image did not at all look washed out or with too much contrast. With such a low magnification, it is no surprise that color fringing is not a problem at all on these. A real highlight of the view for me was that it remained sharp from the center, right to the edges. For a instrument with such a wide field of view this is impressive and is another area where these offer a vast improvement on the Galilean type opera glasses that I have used in the past that suffer quite badly from image softening at the edges. It has a ridgid structure with a soft foam rubber interior, so offers plenty of protection. The Kabuki Glasses come with a simple but effective neck cord that allows you to hang the glasses around your neck when you are not using them. Also included is a cleaning cloth which is of good quality and thus fine for light use on the lenses. If you do happen to get the lenses particularly dirty and need a harsher clean, I would suggest using a full optical lens cleaning kit, just to ensure that you don't mark the lenses. Included within the box is also a user guide and the Kabuki Glasses come with a 1 year warranty. Sorry you cannot see this table as your browser does not support iframes. Click here to open it up in a new tab. I was not sure what to expect before these arrived, but I have to say that in almost every way I was pleasantly surprised. Strong Points: The build quality on the Kabuki Glasses is excellent. Before receiving them I was a little worried that they would feel cheap and maybe have a plastic feel to them. This is in no way the case. You can immediately see and feel that they are very well made using really good quality materials. Small things like the excellent nose grip, the hinges on the ear pieces and the intricate, but extremely effective IPD setting adjustment just add to this feeling of quality and make them easy and enjoyable to use. In my experience, the image quality is superb when compared to your average opera glasses and whilst it is hard to judge because of the big difference in magnification, I would say is comparable to many mid range "standard" compact binoculars. Another worry of mine before testing the Kabuki Glasses was comfort. But this was no issue for me at all, which if you are going to be using them for long periods at a show for example, this is a definite highlight compare to standard opera glasses or Lorgnette opera glasses that have a handle and where you have to hold the instrument up to your face. I really like the protective carry case these come with. Not only does it look great, but does a fine job of protecting the instrument within. This is a BIG improvement on many theater glasses that just come with a soft pouch. Weak points? Compared to most standard binoculars, the minimum focus distance is on these is not great. However as we have spoken about, for it's intended use, this will not be a problem. No Diopter adjustment. For people who have uneven eyesight this is a shame as there is no way of compensating for this as you can on standard bins. This is the same with almost all opera glasses, so compared to their direct competition, they are no better or worse in this area. Whilst the maker is obviously keen to emphasise that his Kabuki Glasses are not just simply opera or theater glasses and that they can be used in a wide range of areas, I think it is important to stress that whilst yes, they can be used in a variety of situations, this may not make them the ideal choice. There is a difference. Theatre, Operas, Ballet, Musicals and Concerts both indoors and out. Many sporting events come to mind - Tennis, Cricket, Baseball, Football and even Sumo! The Kabuki Glasses would also be ideal for uses where having your hands free is essential, so long as you don't require a close minimum focus. 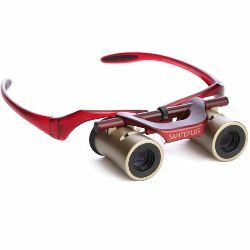 Other uses like birding and wildlife observation are fine and these would work, but I would suggest that if this is your main interest, then you would be better off getting a standard pair of binoculars, that is unless you need to keep your hands free. One of the biggest problem most younger children have is with aiming the binoculars. 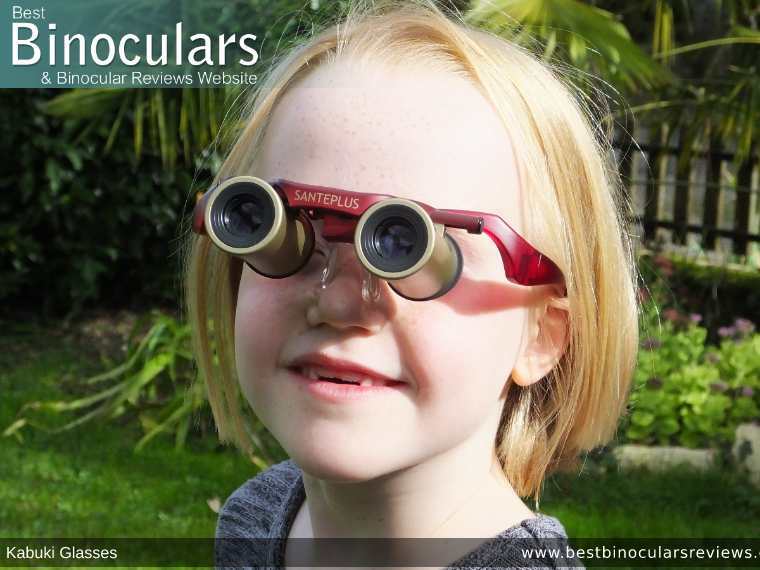 Firstly because most binoculars have a fairly narrow view and because kids are never still or steady, they find it hard to aim and keep the image still on binoculars. I tested the Kabuki Glasses on my 6 year old daughter and whilst she had become pretty good at using "dads binoculars", there was an immediate and obvious improvement with these. She no longer had the fidgety hands problem shared by most kids and once I had set the IPD correctly to match her narrower eyes, she had no problem in aiming, finding and following objects. The only issue I have here is the cost. So I would probably not leave a young child alone with them for too long! But supervised, then these are great. Not only for watching sports or a concerts with her, but also for birding and a whole range of other uses. I would like to thank the inventor Naoaki Sakata for sending me his Kabuki Glasses to test and review. I would also like to make it completely clear that this review like all others on the BBR website is completely genuine and honest. The thoughts and opinions I express on this page are derived after thorough testing and use of the Kabuki glasses and I have not been asked to, nor would I ever be persuaded to write a review with any sort of bias.